In order for Latino students to gain access to higher-paying jobs, it is absolutely critical that higher education and career options after high school are discussed with students early in their high school career. Academic counseling in high schools can help students explore the different options they have once they graduate. In California, Senate Bill No. 451 attempted to expand the role of a school counselor to focus on academic counseling as well as career and vocational counseling; however, not enough was done to ensure that schools had the adequate resources to adjust to this change. Although this bill provides a positive resource to students, not all schools have similar opportunities due to the ways our public schools are funded. Funding for public school varies by location. Those in low-income communities receive less funding compared to those in high-income communities because of the sources of public funds. In the United States, funding for public schools comes from federal, state, and local sources. Almost half of the funds come from local property taxes, which gives rise to discrepancies in schools between wealthy and impoverished communities. Less funding decreases the opportunities for schools to offer beneficial resources to their students. Public school funding discrepancies place limitations on the resources that each school can provide, greatly affecting schools in low-income communities. For many vulnerable communities, educational counseling is absolutely necessary for informing students on the different possibilities after graduation. Students can benefit from the guidance and advice they receive from counselors. Despite some schools not having adequate funding to provide students with necessary resources, there are programs that have been created by community stakeholders to help students become leaders and learn about higher education opportunities. ¡Adelante! 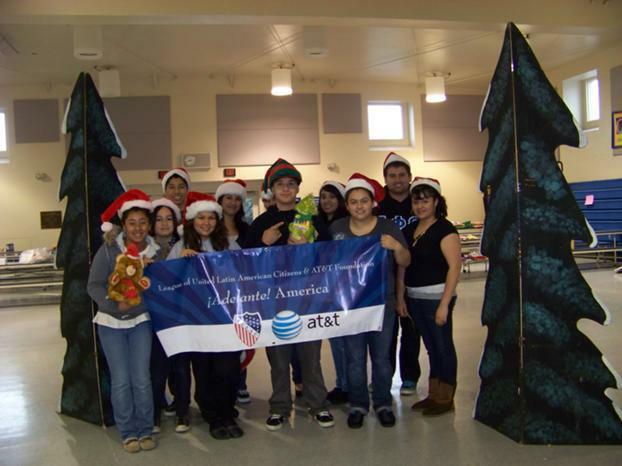 America is a program developed by LULAC with support from AT&T that encourages Latino youth to develop leadership skills while preparing them to attend college. The program helps improve academic skills while focusing on high school completion. ¡Adelante! America motivates students to become leaders via mentorship opportunities and guest speakers. In addition, students are exposed to educational field trips, conferences, hands-on workshops and volunteerism to help them make career choices as well as prepare them for higher education. The benefit of having one-on-one academic counseling sessions allows students to expand their personal development. Absolutely critical to the success of the program is creating a motivational environment where students are encouraged to further their careers beyond high school graduation. Since it launched in 2008, ¡Adelante! America has encouraged and mentored over 10,500 leaders. These types of programs can benefit low-income communities by allowing schools to give their students the best motivational environment. Through programs like ¡Adelante! America, LULAC will continue to ensure that more Latinos have access to a quality education that will lay the foundation for a successful future. Jacqueline Hernandez is a Community Outreach Fellow at the LULAC Sacramento Regional Office in California. She graduated from the University of California, Davis with a degree in Human Development and a minor in Chicano/a Studies. Last Saturday marked the 51st anniversary of the signing of the Voting Rights Act of 1965. As one of the landmark pieces of civil rights legislation signed into law by President Johnson, the VRA extended crucial civil rights protections to all Americans. For decades, the VRA helped protect the right to vote for millions of vulnerable minority Americans in areas where historic racism had left them disenfranchised. After being gutted by the U.S. Supreme Court in the Shelby v. Holder decision, laws aimed at suppressing the voting power of minority communities sprung up across the United States. However, over the past couple of weeks, the courts have taken action and struck down laws in North Carolina, Texas, Wisconsin, North Dakota, and Kansas that were found to discriminate against minority voters. As the 2016 Presidential election approaches—the first without federal voting protections since the passage of the VRA—it’s important that we harness the power of these court victories against voter suppression and demand that Congress take action to restore the VRA. Voting is one of the cornerstones of American democracy. The idea of the eligible voter has evolved over time to include non-landowners, women, and racial minorities, and we can take pride in the fact that more people than ever have the right and the opportunity to play a direct role in American democracy. For such an important task, it makes sense to make it easier to vote so that as many Americans as possible can participate. States like California have led the charge and have enacted legislation that makes it easier for people to vote, such as automatic registration at the Department of Motor Vehicles, extending early voting periods, and allowing voters to access online registration. Efforts like these make voting easier, helping create a more robust democratic society—something that every American should see as a good thing. Unfortunately, not all states have followed California’s lead. The ink was barely dry on the Supreme Court’s Shelby decision when lawmakers in states and counties formerly covered by the VRA preclearance procedure rushed to enact new voting laws. In North Carolina, lawmakers enacted a voting law with strict ID requirements, limitations on early voting, and the elimination of same-day registration. In Texas, voters could only show seven forms of state-approved ID to cast their ballot. Passports, driver licenses, and gun licenses were all valid forms of ID, but a student ID—even from a Texas public school—did not qualify. Ever since the Shelby decision, civil rights advocates across the country began to challenge these rulings—even without strong congressional legislation to aid their cases. Despite this, advocates continued their fight—and won. In July 2016, the 5th U.S. Circuit Court of Appeals ruled that the Texas ID Law had a discriminatory impact on voters and urged Texas to make the necessary changes to remedy this issue. The 4th Circuit Court of Appeals in the North Carolina case went even further, striking down the North Carolina ID law after concluding that it was passed with specific intent to prevent African-Americans from voting after lawmakers requested information on what voting practices African-Americans utilized and then severely limited those practices through legislation. Despite 51 years since it’s signing, current events show us that the fight for the right to vote is not over. The Texas and North Carolina cases demonstrate that there is a concerted effort among state lawmakers to suppress the vote of certain voting blocks that do not vote the way that they want them to. It’s important that we remain vigilant in our communities to ensure that no eligible voter faces any obstacles that prevent them from exercising their right to vote. In her address at the 87th annual LULAC National Convention, U.S. Attorney General Loretta E. Lynch stated that the number of federal election observers will be significantly reduced due to the Shelby decision, placing much more responsibility on local communities to ensure that their elections are fair. However, relying on the goodwill of individuals and local communities is not enough. States must be held accountable to strong federal protections that prevent them from disenfranchising their own citizens. Moving forward, LULAC will continue to advocate for a restored Voting Rights Act that effectively protects ALL citizens and their sacred right to vote. Geoffrey Nolan is a Communications Associate at LULAC National. He graduated from the University of Georgia, with degrees in International Affairs and Spanish.